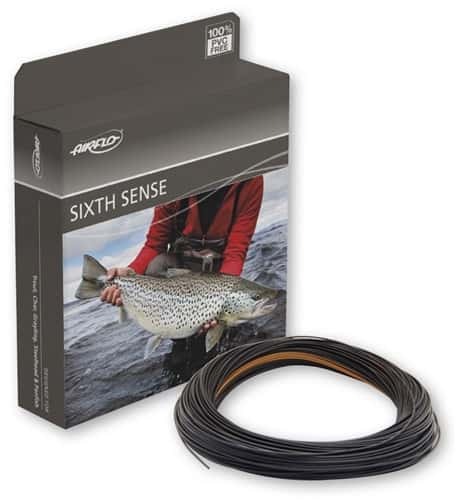 Airflo's Sixth Sense sinking lines are the ultimate full sinking stillwater lines. The low-stretch core makes bite detection and hooksetting a breeze, even at depths that would scare Jacque Cousteau. Airflo's Polyurethane coatings bond better with tungsten than PVC, making them sink fast without sacrificing cast-ability. Available in Sink3, Sink5, and Sink7. As true masters of sinking line technology, remember we’re the guys who created density compensation, low stretch cores, and a standardized sink rate system. So it’s no surprise that we’ve taken this cutting edge range of lines a step further. Knowing how much line you have left in the water is one of the keys to successful sunk line fishing. With our new “Hang Marker“ system, you have color coded marks on your line that clearly tell you how much is still down there. Sunk line fishing just got a whole lot easier.